Besides being home to VBA Thunder Bay, the downtown Port Arthur post office building was also home to many other federal government agencies. The last combined air/marine radio stations physically separated (1986) and became part of the Canadian coast guard under the control of Transport Canada. 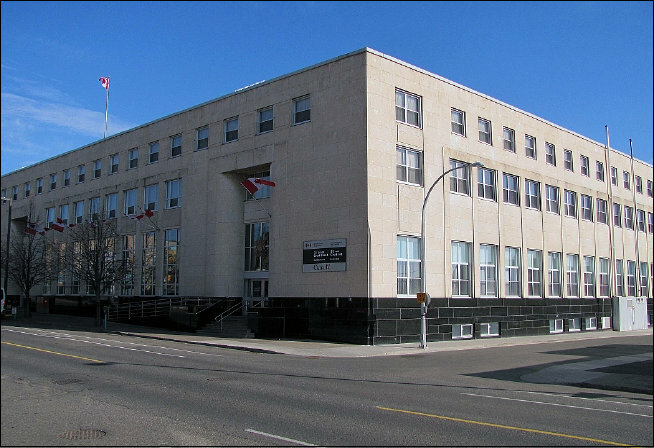 In our case, we moved to the newly renovated 2nd floor of the post office building located in the north end of town (Court Street). The other stations included: VBB Sault Ste. Marie, VBC Wiarton, VBE Sarnia, VBG Toronto, and VDQ Cardinal. 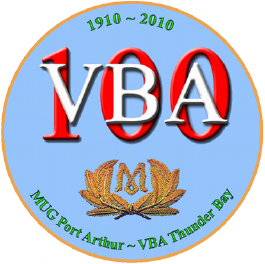 The old VFW5 Winnipeg and VAP Churchill stations were closed and remoted to Thunder Bay using a combination of landlines and microwave systems. Soo and Toronto provided Morse code radio services for the Great Lakes, and Thunder Bay did the same for western Hudson Bay (via the Churchill remote controlled site). The old, tall and grey analog wired consoles were replaced with the new, short and blue computerized ones (Z80 8-bit processors) based based on the Laurentian Region (Quebec) design. The regional programmer, Kevin Drake, spent months at Thunder Bay making programming changes because of our numerous (and probably annoying) requests; later, these modifications were implemented across the country. 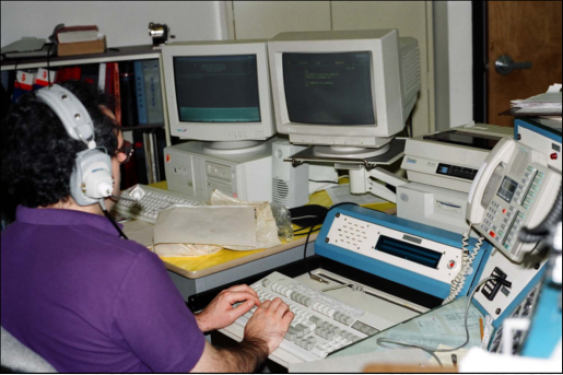 A new computerized logging system called the Message and Data System (MDS) was developed at VBB Soo by regional systems analyst/programmer Jerry Lukac and station manager Joe Gabriel, and our IBM Selectric typewriters with fan-fold carbon logging paper were finally junked! 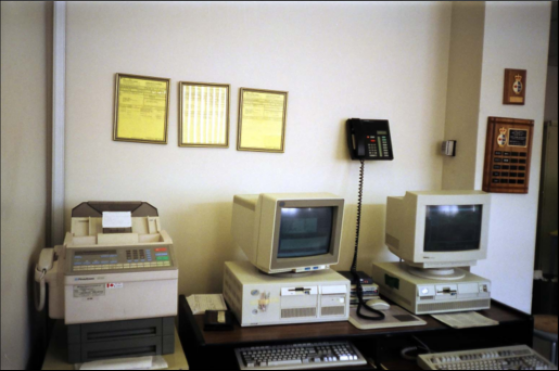 Computerization was all the rage and the push was for a paperless office; little did we know (25 years later) we would be still using the same equipment, and generating and wasting far more paper than the old typewritten logs ever did! Churchill position logging with the MDS. The far left computer runs the Alexander telex program. Telex sent and received landline and radio messages around the world, years before the Internet did! Our radio coverage area included Lakes Superior, Winnipeg, and the ocean waters of western Hudson Bay. Back in those days, we had only paper nautical charts with no computerized data bases to quickly find information (there was a small bookcase and chart table full of material to sift through), so you memorized what you could, and had to know where to find what you couldn't. In the late 1980's, Jerry was tasked with creating a totally computerized and autonomous Continuous Marine Broadcast (CMB) system to replace the old magnetic tape recording system. The ancient continuous-loop tape (8-track type) CMB had been replaced with a quad-cassette tape machine that literally “ate” tapes and had other mechanical issues. At first, his job was just to make a computer “talk”, but we taught Jerry how to be a radio operator, and he taught an IBM computer how to "sing"! Within a few weeks, he had a system working flawlessly, and for 2 years the computerized “Perfect Paul” CMB system automatically retrieved, formatted and "read" weather and other notices without any problems or complaints. Unfortunately, it was a very expensive system and the project was cancelled. Central Region coast guard went with a more cost effective but less sophisticated system called INTERALIA (still in use 2014! ), but it only digitized our spoken voices as we recorded weather and other messages. Today, every modern Windows computer comes with the "Perfect Paul" voice and text-to-speech software, and the US coast guard has used "Paul" to "read" the weather on marine HF (high frequency) channels with a system similar to the one Jerry developed decades ago! Another failed program introduced in the late 1980’s, was the removal of the lighthouse keepers from the Great Lakes, and replacing them with remote sensors feeding telemetry to the coast guard radio stations using a computerized system called the Lighthouse Monitor Program (LMP). After spending millions of dollars and never getting it to work properly, the program was terminated; to this very day, all the Great Lakes lighthouses and their associated navigational equipment are in a state known as “user monitored status”. Reestablishing Morse code services on the Great Lakes in the 1980's (til mid 1990's) at VBB Sault Ste Marie and VBG Toronto was probably not a great idea and it was hilarious to hear ships (at night) trying to call VBB Sault Ste Marine on 500 kHz coming through our Churchill remoted site and we could and would chat with them and call Soo to see if they had any traffic for the ship! Toronto had nothing but all kinds of interference from the Toronto "monster power" commercial AM radio stations just "up the dial". It has been written (erroneously) VBA took over the Great Lakes Morse code service, and while we could work ships (now and then) with night skip on 500 kHz or day skip on 6 MHz (from Churchill) it wasn't an advertised coast guard service. Malcolm, we could use a Kantronics TNC (terminal node controller to transmit computerized Morse code weather broadcasts (phone cord is on top of it). "Whenever a separation is made between liberty and justice, neither, in my opinion, is safe." Personal web site. Not affiliated with any agency. Copyright © 2000-2019 R. C. Mazur, VA3ROM.